The North American Handmade Bicycle Show (NAHBS), the world's largest consumer show for custom-built bicycles, will offer three full days (March 2-4, 2007) of insightful framebuilding seminars by established framebuilders and component manufacturers, including some of the best and brightest of cycling intellect in the industry. Inspiring and educational seminars will cover a wide variety of subjects related to the art, business and how-to of framebuilding, including lug-carving, tig-welding, painting techniques, approaches to custom fit, materials, component design and performance. Anyone with an interest in the art and skill behind handmade bicycles and parts or in the secrets of running your own handbuilt bicycle business is encouraged to attend. "NAHBS seminars include fascinating tidbits and exceptional advice to pique the interest of every attendee, whether they are there to start a business or just dabble in the art of a handmade bicycle. This year's diverse array of speakers offers a great range of perspective, from world-famous framebuilders to lesser-known artisans that are already well-respected in the industry," said Don Walker, founder of NAHBS. Reynolds 953, Keith Noronha and Columbus XCR, Fabrizio Aghito - Clever marketing by the large bike manufacturers for carbon-fiber and steel may have changed the public's perception of steel, but it is still the first choice for framebuilders. Come and find out why at these two free seminars. What's the Hub-Bub? Peter Enright of Phil Wood, Doug White of White Industries and Paul Price of Paul Comp - The "perfect" hub explained by three of the best hub manufacturers in the world. Bring your autograph book! Chickens and Fax Paper, Tom Ritchey - Mountain biking legend Tom Ritchey will talk about successes, challenges and amusing stories of his early framebuilding years. The wheel deal, Nathan Schickel or Mark Van Gemert of ZIPP Speed Weaponry - What makes carbon fiber wheels a must for the fastest handmade bicycles? 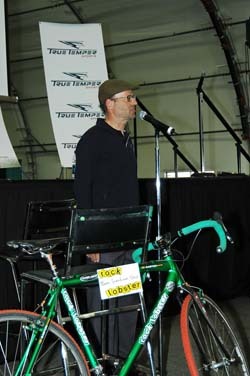 Building frames for competition, Paul Sadoff of Rock Lobster - Racing frames explained by an industry veteran of 20+ years. Lug Carving Explained, Brian Baylis - Learn about lugs from the master of lug craft. Lugs...past, present and future, Hank Folson, a.k.a. Henry James- The first framebuilder in the USA to cast lugs for his frames talks about the evolution of lugs and where they're going. Tig-welding bicycle frames, Steve Potts - Find out the secrets of tig-welding specialized tubing from a leader in custom mountain bikes. How to make paint choices to maximize your custom frame, Doug Fattic - Everything you needed to know about bike paints, prep, and more from one of the most talented painters in the business. Powdercoating Technology, Mark Brandt of Spectrum Powderworks -(Learn about an alternative finish for your bikes that is more durable than paint. Bicycle fitting overview, Peter Mooney - The do's and don't's of custom fitting frames from someone who has been fitting bicycles for over 25 years. Fit 101A, Bill Boston - A leader in bicycle innovation in the realm of proper fit talks about all the tools of the trade you can use to fit your clients. The Business of Professional Custom Framebuilding, Carl Strong - Find out exactly what it takes to make money when you're following your passion! This seminar is only open to exhibitors and legitimate framebuilders for an extra $20. Inspiration, Motivation, Reality and "Bidnez", Ross Shafer - Attend this seminar by the man who built Salsa Cycles and go home energized about your own business! Tickets to the seminar series are limited, which include entrance to all seminars and the exhibit hall, are available on the NAHBS website (www.handmadebicycleshow.com) for $150. Attend these prodigious seminars (10 a.m. - 5:30 p.m. each day of NAHBS) and walk away with enough background information to get your own framebuilding business off the ground and running smoothly. The North American Handmade Bicycle Show is dedicated to showcasing the talents of individuals around the world whose art form is the bicycle. It aims to be a gathering point - online and in person - for frame builders and consumers looking for custom-made bikes, for the sharing of ideas and promotion of this special industry which has such a rich history. After two years of growing by leaps and bounds, NAHBS 2007 will feature still more exhibitors, consumers and a wealth of seminars. For more information, see www.handmadebicycleshow.com.